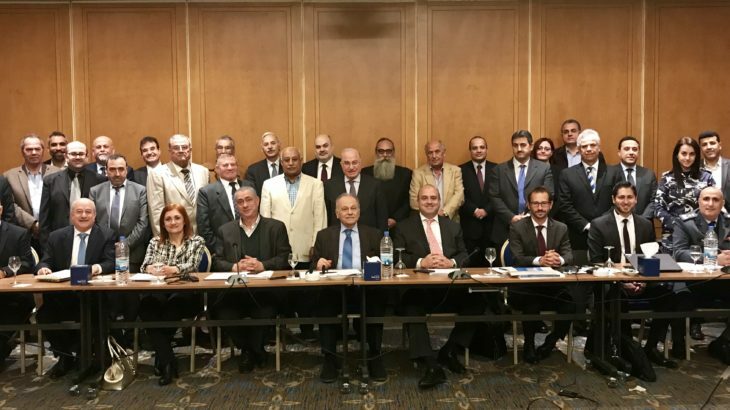 The EU funded EuroMed Transport Support Project, in cooperation with the Ministry of Public Works and Transport of Lebanon, organized a National Workshop on the Customs Convention on the International Transport of Goods under Cover of TIR Carnets (TIR Convention) and on the International Convention on the Harmonization of Frontier Controls of Goods (The Harmonization Convention), in Beirut on 9 – 10 April 2019. The Workshop aimed at presenting the objectives, main provisions and benefits of both Conventions and promoting their implementation. The event was opened by Mr. Abdel Hafeez Kaissi, Director General of the Land and Maritime Transport Directorate, Ministry of Public Works and Transport of Lebanon, and Mr. Michalis Adamantiadis, Team Leader and Road Freight Transport Key Expert of the EuroMed Transport Support Project (EuroMed TSP), with the participation of more than 40 representatives of key stakeholders from the Public and Private Sectors. “Transport facilitation of goods, exported and imported, is a key issue for our economy”, Mr. Kaissi said, “Lebanon is interested in exploring possibilities for better utilization of the TIR by Lebanese transporters and taking necessary measures in addressing existing challenges for boosting its exports, in view of the very special situation in its neighborhood”. The full Press Release can be found here, while more information about the Workshop is available here.